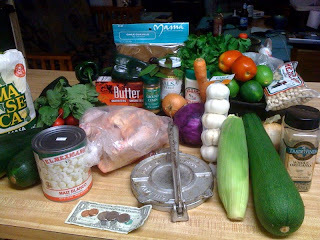 Food-Stamp Challenge, Day Two: Beans! Tonight: Chilaquiles con leftovers. What's Guerrilla: This is basically tortillas, salsa, and broth... What's Gourmet: But it's so good! Materials: Six homemade tortillas ($0.10) the recipe said store-bought and I'll definitely make it that way. The homemade ones are very cheap, but they get way too tough. One 12-ounce jar of tomatillo sauce ($1.99) Half of a cup of chicken broth ($0.25) Total: $2.35 Recipe after the jump. Method: 1) Let the tortillas get nice and dry (leave them out on the counter overnight or put them in a warm oven for an hour) then cut them into quarters. 2) Get plenty of butter hot in a pan and toss the tortilla pieces in to fry in batches until crisp. 3) Pour the fat out of the pan (save it!) and put all the tortillas back in. 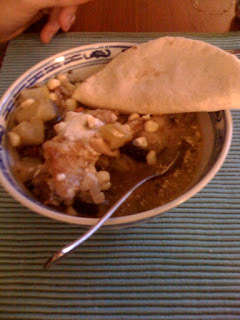 4) Thin the sauce out with the broth, pour it over the tortillas, mix it together and let it simmer for five minutes. 5) Drizzle with crema and serve hot! This one was pretty weird. I've had this before with store-bought tortillas and scratch tomatillo sauce, and I think that's the way I'll do it next time. The cheap Trader Joe's salsa was thick and kind of nasty. 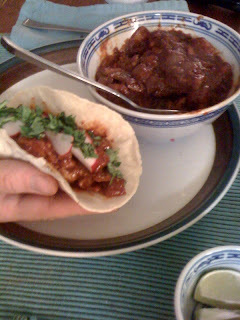 Also the thick homemade tortillas were nasty and leathery, but it was inexpensive, filling, and cheap! We also had this with leftover beans (free!) and about $0.99 worth of sauteed Zucchini. For our first night, we decided to make a classic. 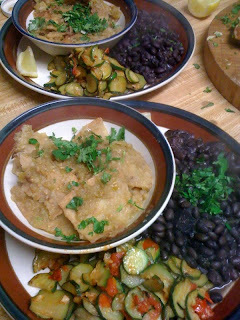 mostly vegetarian Mexican meal: Calabacitas con Pollo. What's Guerrilla: Zucchini, corn, chiles, and tomatoes are cheap in late summer, and this preparation brings our their flavor with a minimum of extra ingredients or expensive meat. What's Gourmet: This stew brings delicious herbal flavors together with a gentle heat. One pound of zucchini (about $1.00 at $0.99/lb) roughly chopped. One tomato (about $0.25 at $0.99/lb) roasted, peeled, and roughly chopped. One Poblano chile (about$0.33 at $0.99/lb) roasted, peeled, deseeded and roughly chopped. One small onion (about $0.12 at $0.49/lb) thinly sliced. One ear of corn ($0.59 each) kernels cut off. Total cost: $3.59 makes two satisfying bowlfuls! 1) Toss the Zucchini in a bowl with a large pinch of salt. Let sit for about 30 minutes. 2) Heat the butter in a skillet or saute pan and brown the chicken pieces on all sides. 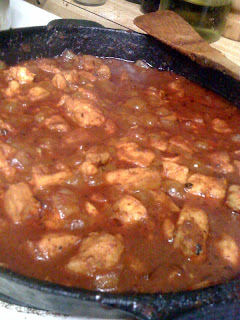 3) Remove the chicken from the pan (leave the fat!) and toss in the onions to soften for five or ten minutes. 4) Add the garlic for one minute (until fragrant) then add the tomato and fry until soft. 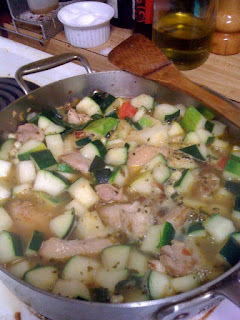 5) Add the chile, corn, spices, chicken and zucchini. Pour in the chicken stock and stir thoroughly. Simmer for about 30 minutes or until the squash is tender. Serve with homemade tortillas (recipe coming soon). I'm thinking we should have budgeted for a mid-afternoon snack and some dessert. That said, I'm probably just fine without potato chips and cheesy poofs. 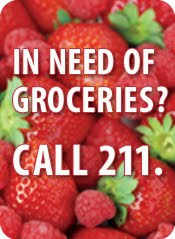 The San Francisco Food Bank has issued an intriguing "hunger challenge" to foodies: live on what the average food stamp recipient receives to feed themselves (that's $4 per person, per day) for the week of the 20th through the 26th. We're coming late to the challenge, since I only saw the ad today, but we're going to try it until Friday anyway. 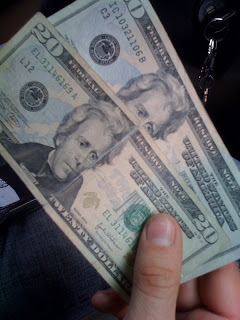 Shopping on $40 dollars (that's five days and two people) is, to say the very least, quite a challenge. Here's what we bought to make it happen: One Chicken, $7.03 The rest of the story, including some minor thievery, after the jump! A Cabbage $0.75 2 Slices of Bacon $1.00 A Bunch of Cilantro $0.50 An Ear of Corn $0.59 One Bag Dried Guajillo Chiles $1.89 A Bottle of Crema Mexicana $2.89 One Pound Dry Black Beans $0.99 One Tube of Garlic $0.79 Two Pounds Green Chiles $1.98 One Can Hominy $1.29 Five Limes $0.50 One Pound Butter $2.49 Four Medium Onions $1.50 Bunch of Radishes $0.59 Tomatillo Salsa $1.99 Two Tomatoes $.50 One Pound Chickpeas $1.49 We also "bought" several things from our pantry at prices we found around town. Obviously most people on food stamps don't have the luxury of growing their own zucchinni or of buying 25 pound bags of flour, but we didn't want to waste spices and produce that we already had lying around. Package Dried Oregano $0.79 Package Ground Cumin $0.79 Five Pounds of Flour $3.00 Three Pounds Zucchinni $2.50 Some Masa Harina $1.00 Yeast $0.20 Jam $1.25 This last bit is pretty pathetic. There just wasn't any money left over at the end, so we swiped packets of the following ingredients from fast food joints. Salt Pepper Sugar Hot Sauce Taken together, our purchases amounted to $38.07. From that, we plan to make Calabacitas con Pollo , Chile Colorado, Posole Rojo con Pollo, Black Bean Soup with Bacon, and Chilaquiles with Tomatillo Sauce. That leaves $1.93 for a few more limes, another onion or tomato, and whatever unforeseen things may happen. Expect a recipe every day until Friday, with reflections! More pre and post pictures of food and fun after the jump! For now, the victorious hosts must take a nap and order some chow-in. As no one will be surprised to hear, San Francisco is a foggy place. While most of the natives will claim to love the fog, everyone who lives here has got their cure-all for those foggy mornings. Quick and easy homemade soups are a natural suggestion and this Spicy Egg Drop Soup draws from the Bay Area's Asian culture and uses fresh ingredients to really make things pop! What's Guerrilla: This dish can be made in twenty minutes using things you probably already have in the fridge. All of the ingredients are inexpensive and easy to find (the majority of them you can get at a 7-11!) And, with such small amounts of each ingredient, you're free to add, subtract or modify each taste component to match whatever is fresh and in season. What's Gourmet: The balance of the dish is perfect, creating a multi-faceted palate with a light finish. By using fresh ingredients, this soup blends the very best of each season, without relying on heavy starches for filling. And by drawing from classic Chinese preparation, this version of egg drop soup is clean and light, versus the take-out version that can be a bit sludgy. Recipe after the jump. The Soup Broth 1 ripe tomato, cut into 1 inch wedges 1 cup stock 1 teaspoon caster sugar 1 Tblspoon rice wine vinegar 1 egg Salt and Pepper to taste Optional additions Red cabbage, thinly sliced Cooked vermicelli rice noodles Black Seaseme Oil Seaseme Chili Oil The Method 1. Heat oil to a nice shimmer in a thick bottomed soup pot. 2. Add the starting five and sautee for a few minutes, till they're beginning to brown but not soften. 3. Add tomatos and allow them to sautee for about five minutes, till they've begun to give off their juices and soften. Stir often, slightly mashing the tomatos against the sides and bottom of the pan. 4. Add stock, sugar and vinegar, bring to a boil and taste for salt and pepper. You can also add red chile flakes at this point if the heat is not where you'd prefer it. 5. Add the egg to the soup. 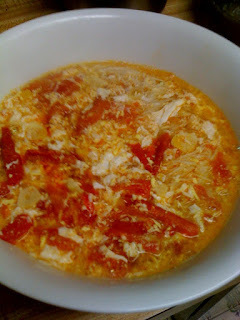 There are tons of different methods of creating the perfect egg drop soup. However, the best method we've found is to break the egg into a seperate glass and add it to the soup through fork tines while stiring in a clockwise direction throughout. The beauty of this dish is that the citric acid in the tomato and the vinegar in the broth will help the egg poach cleanly, no matter what method you use, which will keep your soup from getting that slodgy texture. 6. Spoon the soup over whatever you'd like (I prefer sliced red cabbage and cooked noodles) and garnish with the green onion greens and the optional chile oil or black sesame oil. 7. Grab some chopsticks and enjoy! One of our biggest secrets about dinner party is planning in advance. We typically plan our menus via inspiration and our meals through sheer will. After a number of stressfull events, pulled off at the last minute, we didn't want to mess around with six courses. We split our grocery list into two segments: pre-buy and purchase day of. Then we did a dry run, practicing how long each course would take to make. Lastly, we decided to nearly fully prepare the major courses the day before, reserving oven time for heating dishes up and time for plating. Details and specifics after the jump, we've got to get cooking! So, now that we've decided to plan a dinner party for six of our friends with six courses for (ideally) less than $60...we're feeling a bit nervous. To be honest, I tend to over plan and worry too much, but this time I'm committed to keeping it balanced and stress free. So, to get everything started, we assembled our guest list- two of my coworkers and two of our college friends. All four are super into food and offered to bring the wine (whoo!) With the wine taken care of, we started to assemble the menu. Instead of choosing recipes that we're only interesting, we went to the Farmer's Market to be inspired. Late fall in California tends to squash, eggplant and chestnuts...which had us thinking of warm Italian kitchens. Rustic, hearty and down to earth, Itallian food has taken on a gourmet glint but lately has been returning to a simpler time. With this menu set, the guests selected and the wine taken care of...we were ready to start shopping, chopping and eating! While the flu season may be a theoretical concern for most these days, it's become a reality in our house for the last few days. Yes, always the social debutante of germs and infections, Tiffany has once again fallen ill with something that's going around. This got us to talking about what foods make us feel better when we're sick. 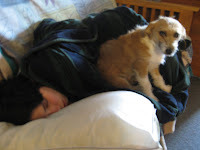 For Tiffany, the perfect sick person food has two essential elements. Whatever it is, it needs to be A) liquidy and B) spicy! So from there you can take your choice of any dish from calabacitas to tom yum kai or all the way around to her close friend, Tore's infamous chicken soup with stars. And anything cooked by hand or with any kind of affection earns double points! For Eric, sickness isn't the real issue. He doesn't get sick very often, but he does get some pesky hangovers. And the best thing for that is greasy and spicy! The smoked ham with string beans from Henry's Hunan is pretty good, as is the Tom Kha Gai from King of Thai Noodle. If I'm stuck at home at the time (and let's face it, I usually am) a grilled cheese sandwich with green chile is the best! So, we want to know - What makes your sick heart feel well? Two lucky winners will be selected from those who comment to be the first vacinated for H1N1*. *While supplies last and there are no current supplies as neither Tiffany nor Eric, nor anyone connected with the Guerrilla Gourmet can figure out how to do this. So instead both winners will recieve the first dose of our, one of a kind, special/wishful vaccination.